Members of the Vermont House Government Operations Committee discussing S.8. If you ever want to witness a world-class blizzard of hypotheticals, just check out a roomful of lawmakers discussing a bill that affects themselves. Case in point, S.8 — this year's iteration of an ethics reform bill, already beaten down by multiple blizzards on the Senate side, now trudging upwind in the House Government Operations Committee. On Wednesday morning, the panel began its discussion of S.8. A Legislative Council staffer carefully explained each provision of the bill, and members parsed the various jots and tittles therein. When it comes to subjects like ethics reform or campaign finance, the debate takes on a level of scrutiny worthy of the pickiest Pharisee. Such was the case in House Gov Ops, although only one section of the bill was actually rewritten. In nearly two hours of deliberation, members worked through three and a half sections of a bill that's 16 sections long. 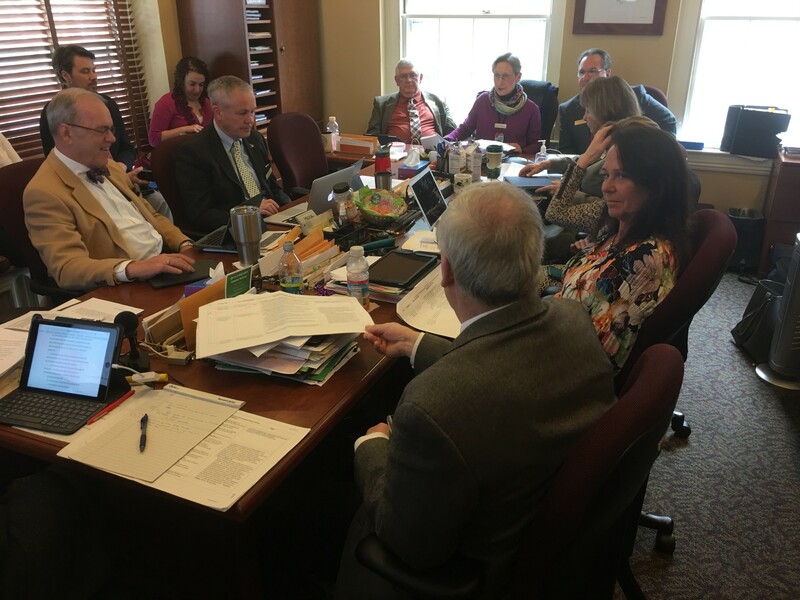 Committee chair Maida Townsend (D-South Burlington) is hoping to finish the walk-through and conduct a final vote on Thursday, while holding the prospect of a dreaded Friday afternoon session over the heads of her charges. As passed by the Senate, S.8 would establish an authority-free, minimally-funded state ethics commission with a part-time executive director. The bill also sets new rules aimed at slowing the "revolving door" between public service and lobbying, limits political contributions by contractors who receive no-bid state contracts, and sets new financial disclosure requirements for officeholders and candidates for statewide office. The committee balked at a measure that would require candidates for statewide offices — governor, lieutenant governor, attorney general, auditor, secretary of state and treasurer — to disclose their tax returns. The most full-throated opponent was Rep. Ron Hubert (R-Milton), who labeled the provision an invasion of privacy and floated the most far-fetched hypothetical of the day: that the requirement would scare candidates away, even resulting in empty ballots and unfilled offices. "Why do people need to know all this?" he thundered. "To me, this is a fishing expedition, an infringement on people's rights." He offered a sarcastic apology to anyone who "wants to know what time I brush my teeth." Calm down, sir. No one wants to hear about your grooming regimen. But there might be an actual public interest in knowing the personal financials of a potential governor or, goodness knows, treasurer. There is a perfectly valid argument, especially in the age of President Donald Trump, that anyone who seeks high public office can be subjected to higher disclosure standards than the average bear. But no one on the committee made that argument, and the tax-disclosure section was stricken from the bill, with Rep. Warren Kitzmiller (D-Montpelier) casting a lonely vote to retain it. The only other change made on Wednesday actually toughened — very slightly — a financial-disclosure standard for state officeholders. The Senate version calls for officials to disclose, by name only, all income sources of $10,000 or more. No specific amounts, just a simple list. The House committee opted for a ranked disclosure of all income sources of $1,000 or more. Each person would list all income sources in descending order, but with no specific amounts. The committee adjourned at noon, in the middle of discussing section four. Which leaves them with 12 and a half sections to cover in, at most, the next two days. Should be entertaining, in a watching-paint-dry sort of way. Before launching its walk-through, the panel heard from witnesses who suggested changes that seem destined for the cutting-room floor. Michael Palmer of the Middlebury consulting firm Ethics By Design urged the panel to give the ethics commission a full-time executive director. "My guess is that the 'part-time' executive director will end up working full-time anyway," he noted. "You can't just turn off the switch and go home. It will require lots of volunteer time." Lawmakers envision a staffer sitting around waiting for complaints to come in. Palmer points out that fielding ethics complaints is far from the only duty on the executive director's desk. That person would have to oversee an ethics program with educational and training components and be available to offer advisory opinions for state officials and members of the public, among other things. But hiring a full-timer would add to the cost of the ethics commission, which weighs heavily on the minds of lawmakers. No member of the committee expressed support for the idea, but they will get a chance when the walk-through reaches that section of S.8. A spectacularly ill-timed suggestion came from Rep. Matt Trieber (D-Bellows Falls). He noted that the revolving-door provision would bar lawmakers from becoming Statehouse lobbyists for a full year after leaving office, and said that the same standard should apply the other way — to lobbyists becoming lawmakers. Also on Wednesday, the (until recently) longtime lobbyist Jim Harrison was to be formally seated as a state representative, having been appointed by Gov. Phil Scott to fill a vacancy left by the resignation of Job Tate (R-Mendon). Harrison is a very popular guy in the hallowed halls, as this writer witnessed firsthand. During a brief hallway conversation, just about every passer-by stopped to offer heartfelt congratulations to Harrison on his appointment. "This is the worst day to present my suggestion," Trieber acknowledged ruefully. He praised Harrison's character to the skies, but added that "ethics is also about perception," and the revolving door creates a perception of insider dealing. No committee member spoke in support of Trieber's suggestion. Indeed, the committee's deliberations often revealed a tone-deafness to outside perception. There were denials aplenty that any ethics law was really needed, except perhaps to quiet outside critics and reduce that pesky perception problem. Many committee members seemed to be shocked by the very idea that their ethics might be called into question. Which seems downright strange, coming on the heels of former senator Norm McAllister's disgrace, the ever-simmering EB-5 scandal, and the unprecedented independent investigation of then-attorney general Bill Sorrell, not to mention Vermont's reputation as a friendly place for embezzlers. Perhaps we need another scandal to pierce the veil of institutional denial. Given what we've already been through, one has to wonder how bad a scandal it would have to be.